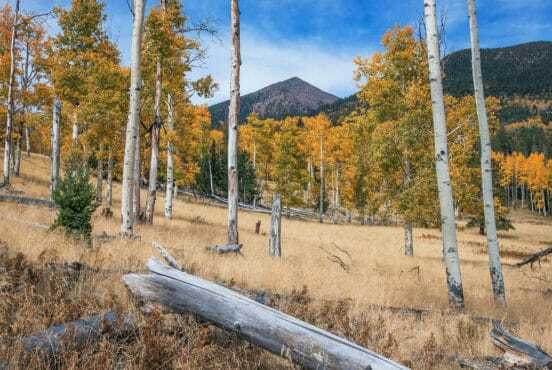 Tucked up in the cool pines, this quaint mountain town in Northern Arizona makes a great vacation “home base”, especially if you choose to opt out of the motel experience and spring for a cabin rental. After a day sightseeing at the Grand Canyon South Rim — just an hour from town — there’s nothing quite like cuddling up by the fireplace in your own mountain cabin. 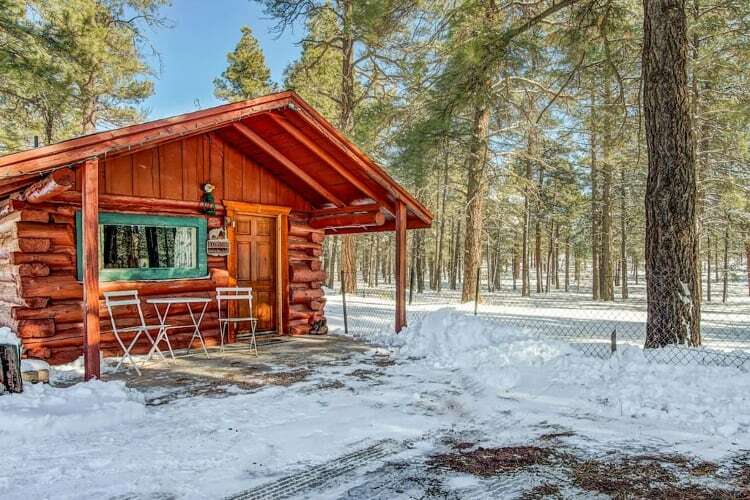 We’ve rounded up 15 cabin rentals in Williams offering cozy and charming accommodations. 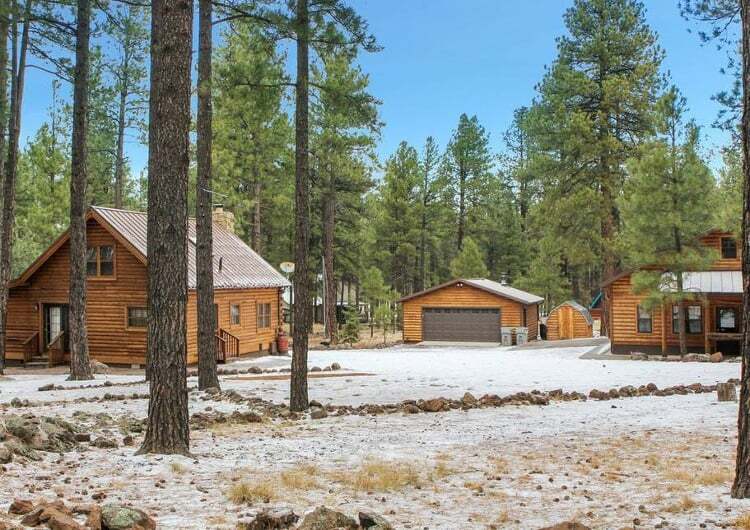 This family-friendly cabin sits in a quiet and serene location surrounded by pine trees, but still close to Route 66 and Grand Canyon Railway. Remodeled in 2006, the A-frame cabin was originally built in 1973 by a Norwegian-American craftsman, and his attention to detail shows in the cabin’s beautiful woodwork. Reviews describe the cabin as charming, cozy, and comfortable, and its owner as friendly and helpful. The cabin sleeps six and has a large front deck to enjoy your morning mug of coffee or evening glass of wine. Be aware that the cabin does not provide a washer and dryer. Robin’s Retreat is a quaint and charming little cabin in the middle of the Sherwood Forest Estates. 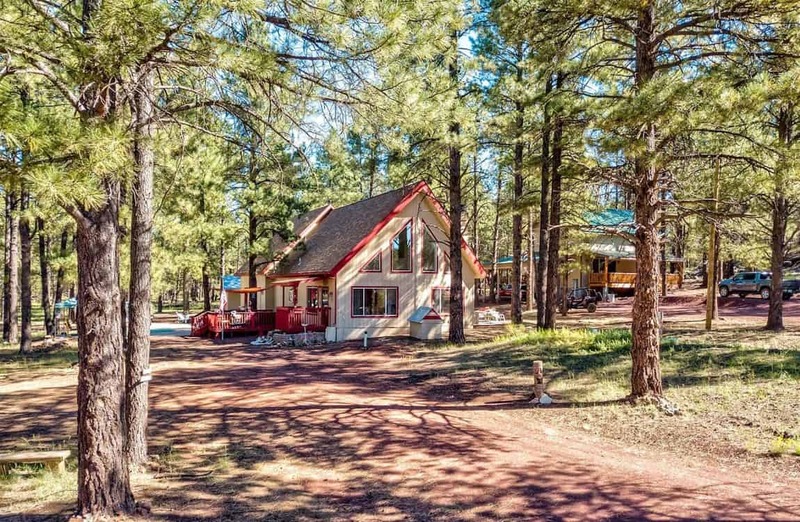 Sleeping eight people, the cabin’s property stretches over more than an acre of land, and the cabin is “a stone’s throw from Williams and only a 30-minute drive from Flagstaff.” The cabin itself is almost 1,600 square feet over two levels. Enjoy a beautiful great room under the open loft that includes a wood-burning fireplace (bring your own wood), picture frame windows, and a reading nook. The kitchen is well-stocked with appliances and condiments, and outside, you’ll find a deck with a gas barbecue grill. Most pets are allowed (a small dog that stays off the furniture is preferred), and children are welcome. The driveway is big enough to accommodate multiple vehicles. 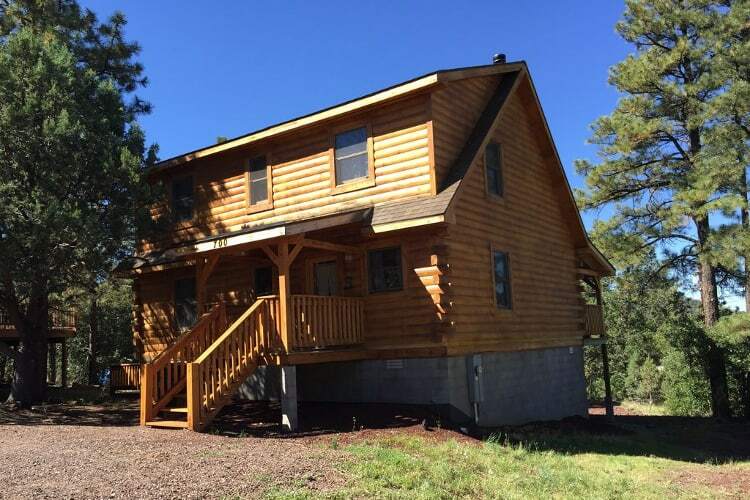 Enjoy a quiet vacation in this affordable and beautiful cabin. 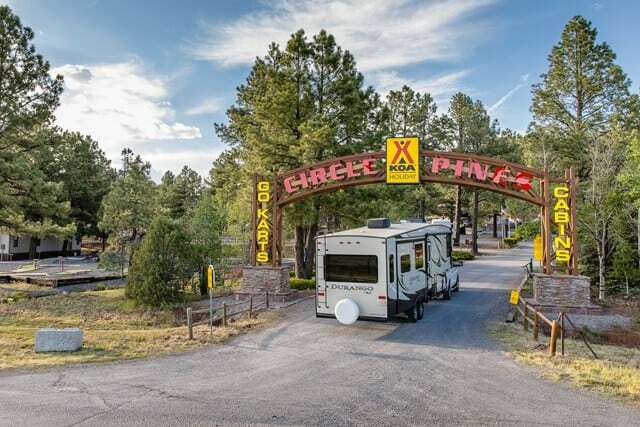 Kampgrounds of America is the world’s biggest system of privately-owned campgrounds, and this location four miles east of Williams, Arizona is a good one. 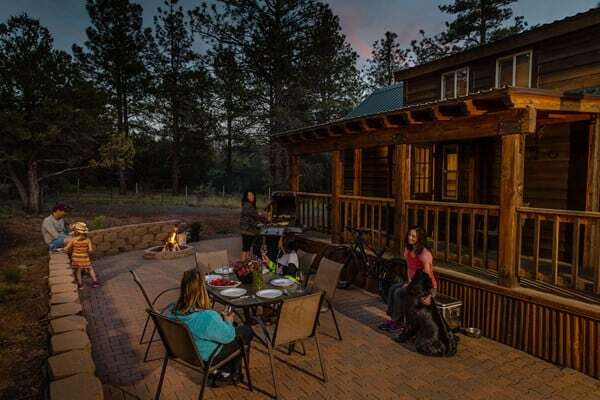 Circle Pines offers three types of cabin offerings (see below for the Deluxe Cabin) and a long list of amenities: free WiFi, an indoor pool, hot tubs, mini-golf, playgrounds, a gift shop, laundry facilities, hot showers, and more. The basic cabin is the most economical choice, but they offer teepees if you want to get a truly kitschy KOA experience. At Circle Pines, you won’t be bored either. 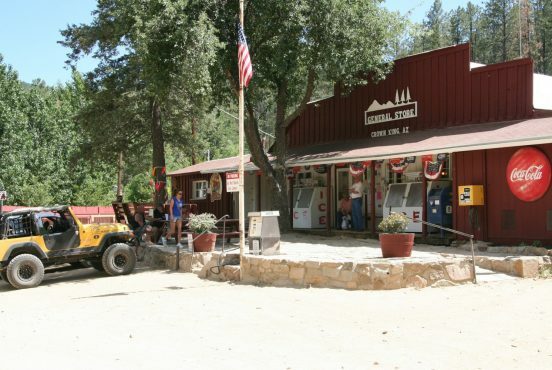 Head to the Bear Trax Cafe on the weekend for breakfast or dinner, go on a hayride, or take a drive around the Grand Canyon Go-Kart track. Circle Pines is fun for the whole family. 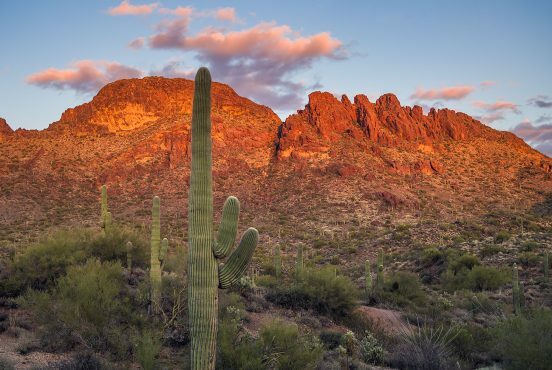 Editor’s Note: Native Americans in Arizona never lived in teepees. 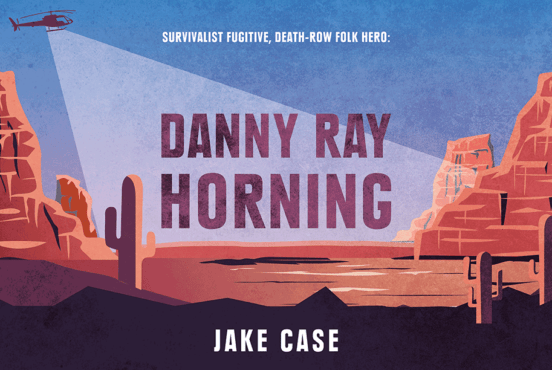 For a more accurate depiction of the state’s rich indigenous history, please visit the Tusayan Museum and Ruin in Grand Canyon National Park or the wonderful sites at Walnut Canyon and Wupatki National Monuments near Flagstaff. Described as “best in the park,” this deluxe cabin located in the Circle Pines KOA sleeps eight in its two single beds, one futon, one queen bed, and sleeping loft. The cabin includes a partial kitchen, a full bathroom with a shower, and cable (choose from over 20 channels). It also includes air conditioning, heat, a picnic table, a fire ring, and a charcoal grill. However, pets are not allowed. If the Deluxe Best in Park is already booked or isn’t right for you, Circle Pines offers several other cabins, as well. The Deluxe Cabin family style is right in the thick of things in the middle of the campground with a private fenced-in yard, and the Deluxe Cabin log cottage is charmingly rustic. 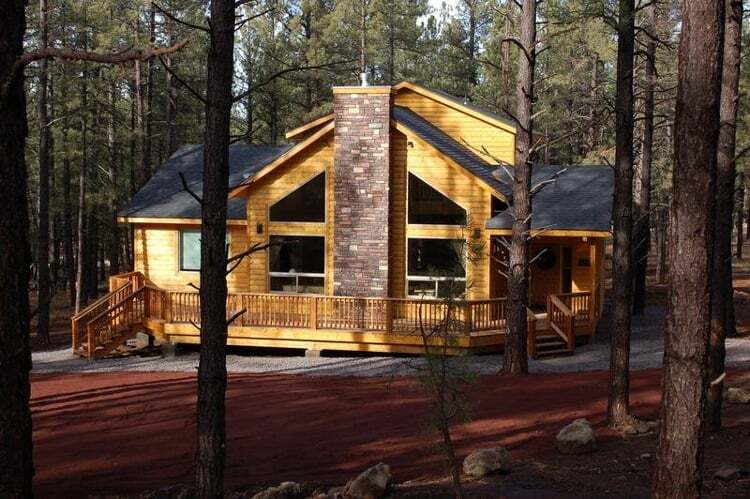 You can find another KOA located just north of Williams offering cabin stays as well. Nicknamed the Ravenwood Cabin, this cabin has two bedrooms, two bathrooms, and comfortably sleeps 4-6 people thanks to a trundle bed and sleeper sofa. The property offers a view of Cataract Canyon, a wooden ravine to the east. Ravenwood is a classic log cabin, creating a homey and cozy feel. The cabin features a Bose speaker system, a furnished deck, flat-screen TVs with streaming capabilities, parking for three vehicles, games, puzzles, and more. This 2,300-square foot cabin sleeps eight people in three bedrooms. Little touches like a highchair in the kitchen and a safety gate in the closet make this a great choice for families with young kids. Outside you can enjoy Frisbee golf, the outdoor grill, a propane-powered fire pit, and biking — two adult bikes and two child bikes are available, but no helmets. The house also has multiple spacious porches. 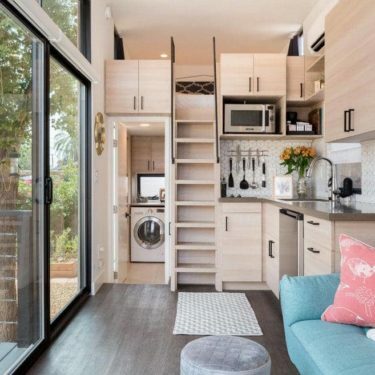 Please note this property is not wheelchair accessible, pets are not allowed, smoking is only allowed outside, the minimum age of the primary renter is 25, and the minimum stay is two nights. The Ontario Avenue cabin has four bedrooms, three bathrooms, and can hold ten people. 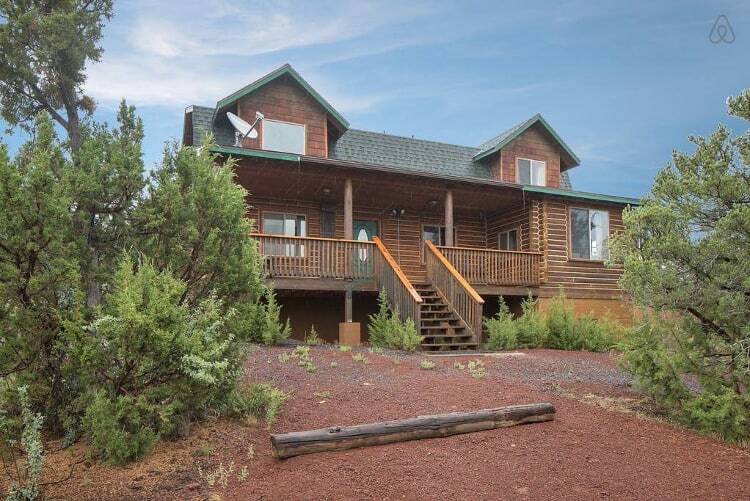 The mountain views alone are worth the price (the cabin’s owner recommends enjoying them from the swing on the front porch), and it’s a short drive to even more amazing views and attractions — 45 minutes to the Grand Canyon, 40 minutes to Flagstaff, and 10 minutes to downtown Williams. Inside, the Ontario Avenue has log walls, vaulted ceilings, and cozy decorations. Take advantage of the stainless steel appliances in the kitchen and the gas barbecue grill on the back deck. Children are welcome and pets are considered. If the idea of staying within walking distance of downtown Williams appeals to you, this cabin is the right choice. Close to the town and the lake, this 1,490-square foot cabin sleeps eight people in its three bedrooms — a downstairs master suite and two upstairs bedrooms, one with bunk beds and a single, the other with a queen and a double. 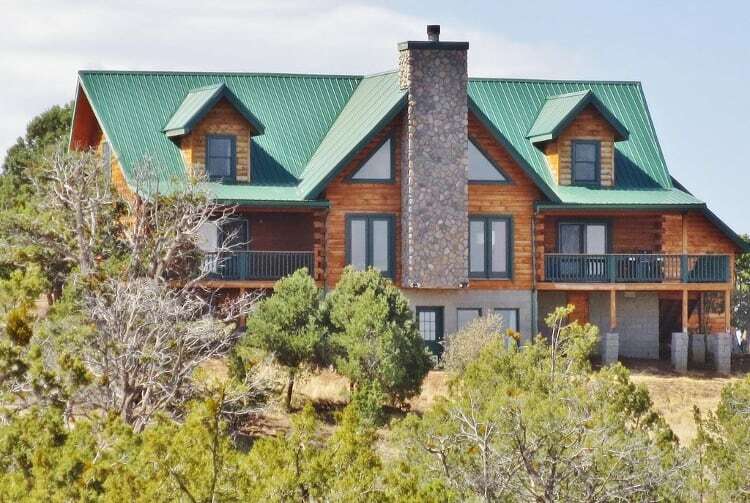 The rustic log R & R Ranch is gorgeous, comfortable, and located on 20 acres with fantastic views inside and out. 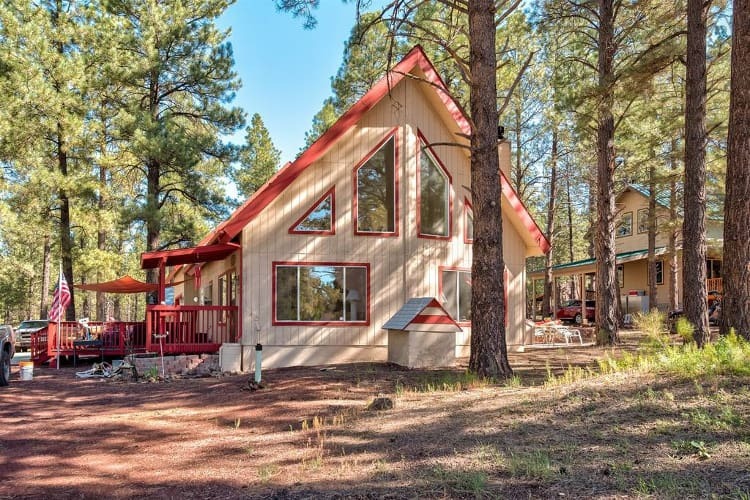 Half of the property is covered in forest, while the other half is an open prairie with views of the San Francisco Peaks — the highest mountain in the state of Arizona — letting you choose your own adventure each morning. The R & R Ranch sleeps 14 people with a king size bed and jetted tub in the master bedroom. The 3000+ square foot cabin also includes a loft with six bunk beds, an air hockey table, and a queen size bed. In the Great Room, you’ll find a 70” flatscreen TV and a big fireplace. 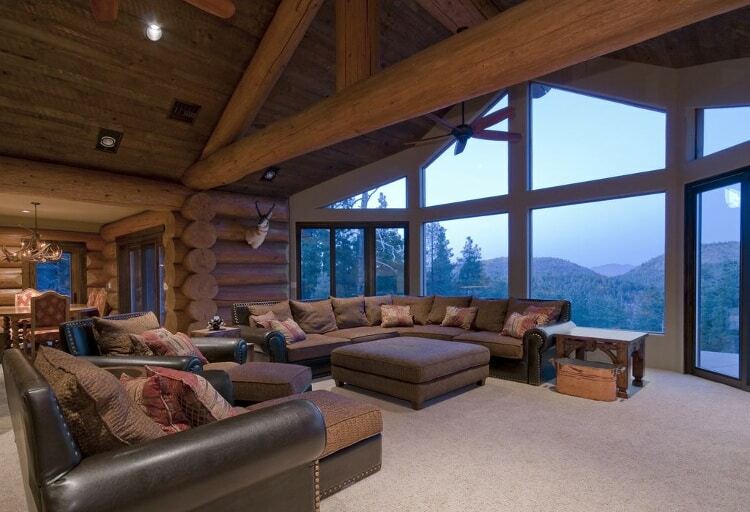 If you love sweeping mountain vistas, this cabin has arguably the best views on the list. 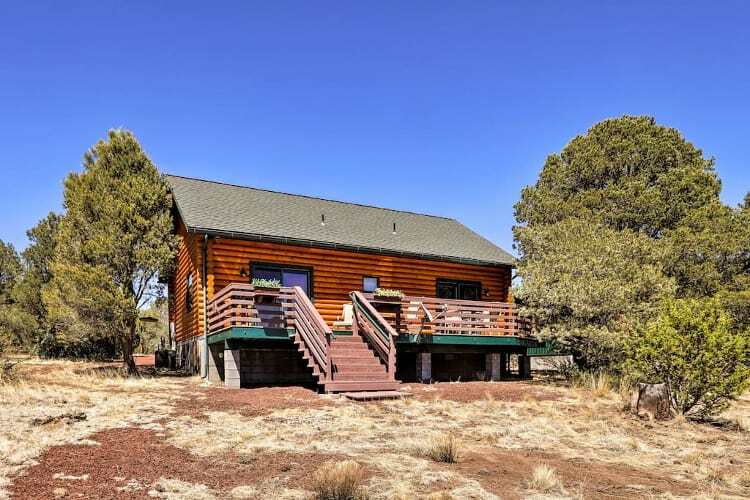 This cabin has everything you need: air conditioning, heat, plenty of appliances in the kitchen, flat screen TV’s, and a back porch that’s made for relaxing. At 3,500 square feet, the cabin has three bedrooms, three bathrooms, and one half-bath, and sleeps ten people. 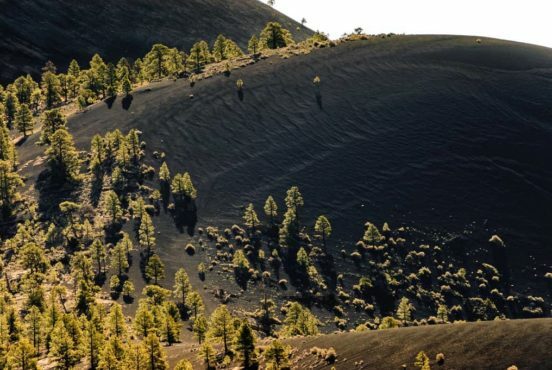 It’s unlikely, but if you get tired of the mountain views, head into town; you’re a two-mile drive from a scenic railway tour. You’re also in close proximity to Elephant Rocks Golf Course, the Wild West Show in downtown Williams, and Route 66. Minimum stay is two nights. 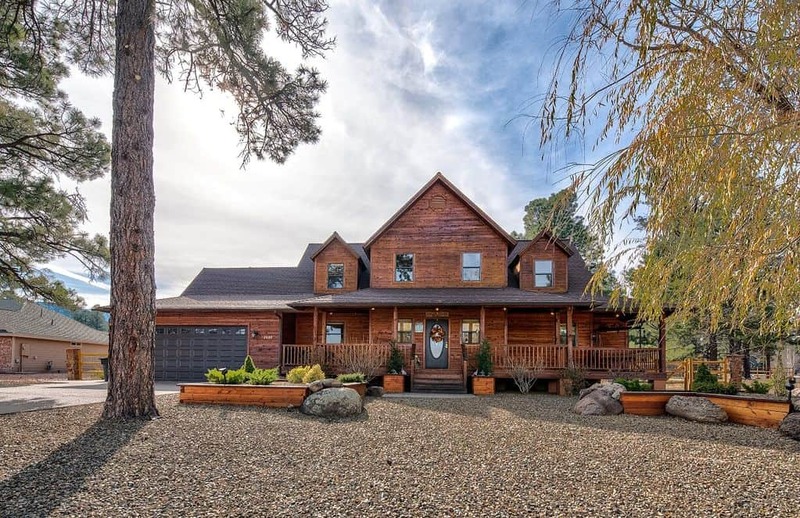 The nightly price of this cabin might make you flinch, but don’t run away yet: the 5,000-square foot cabin sleeps 14 people and is located on 11 acres of a gated community with views nothing short of breathtaking. The San Francisco Peaks stretch across the horizon — enjoy the view from the main room, deck, or some bedrooms. The log cabin is hand-hewn with no expense spared, from the beautiful log trusses to the granite countertops to the custom slate floors. This cabin is spacious enough for the whole family and is stocked with 200+ DVD’s, outdoor grill, surround sound stereos with separate zones, a bar in the basement, and more. Be aware, though, that you’ll need a four wheel drive vehicle if your stay is any time from October 1st to March 1st because of a steep hill and potentially snowy or muddy conditions. Roger’s Cabin is located in Parks, about 15 minutes away from Williams. Roger’s Cabin is a little different from other options on this list because it doesn’t have a long list of amenities. 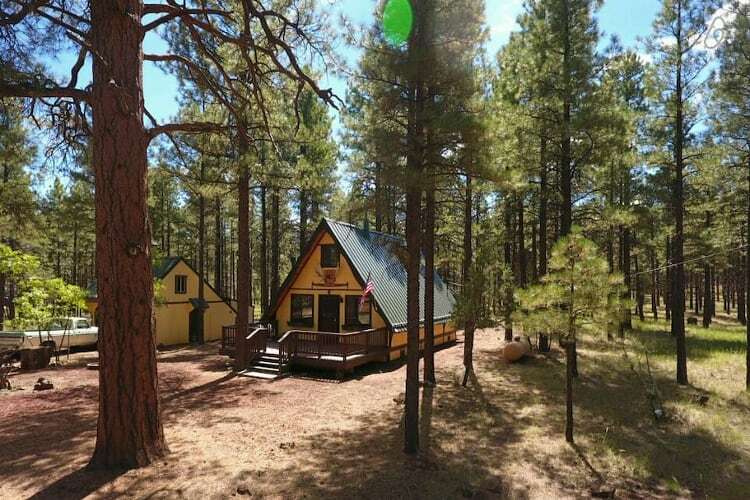 Instead, it’s a one-room (200 square feet), two-guest historical log cabin with peaceful views of the Kaibab National Forest. Sit on the quiet deck and watch for elk in the yard. 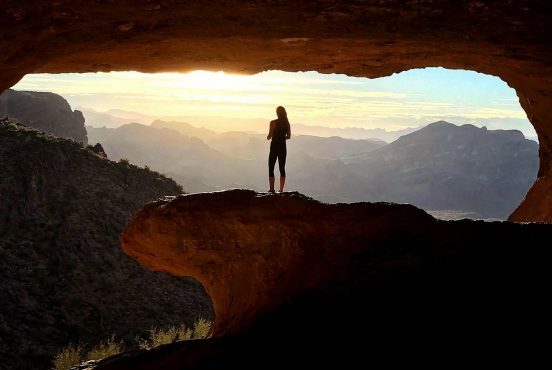 If you begin itching for an adventure, you’re an 80 minutes from the Grand Canyon and 20 minutes from Flagstaff. Roger’s Cabin provides a different experience than other options, but it’s an experience that could be special and refreshing. 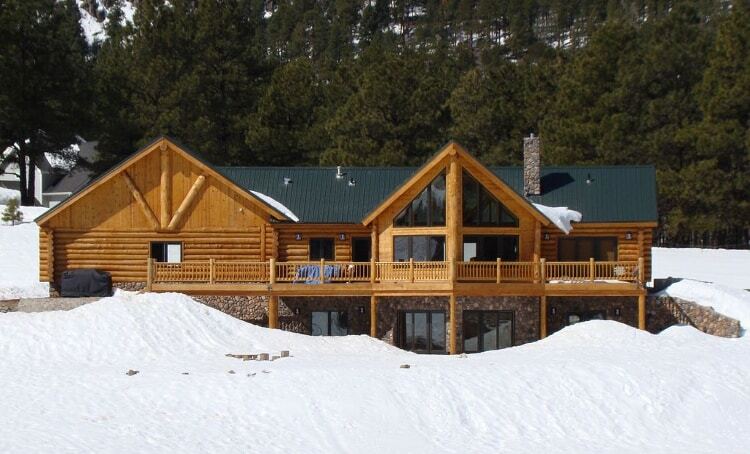 11 guests can stay in these two cabins situated on three acres, 12 minutes east of Williams. The main cabin has a covered front porch, a wood burning fireplace, and an updated kitchen with everything you need; the guest cabin has a wet bar in the living room, plus a big game room that includes a ping-pong table and game table. The property also includes a zipline, horseshoe pit, and fire pit (with firewood included). This is a great location for families and the spacious property means endless adventures for kids and adults alike. No pets are allowed and if you need to cancel, you can get a 50% refund as long as you cancel up to seven days pre check-in. The view at this custom-built cabin is breathtaking: sitting at 7,200 feet and bordering state land, you get a 180-degree view of Northern Arizona’s woodlands. Ten people can stay in this cabin across its three floors and four bedrooms, so there’s plenty of space for everyone. The owners recommend renting for a family reunions, honeymoon, or birthday vacation — no weddings allowed, however. 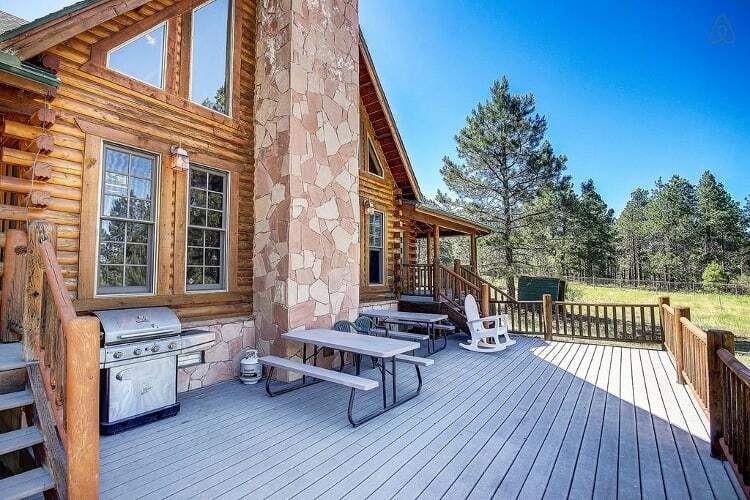 The deck includes a propane BBQ grill and a killer view, while the kitchen has a dual fuel stove and maple cabinets. There’s also a large grassy area next to the house for picnicking or playing. The cabin is kid-friendly, with a crib and pack-n-play. Pets are not allowed and the minimum stay is 2–3 nights. Tucked in the tall pines, Buck N Ham Palace is located just minutes from Williams in the Sherwood Forest Estates. The cabin can sleep twelve people, and its open floor plan makes for effortless entertaining. With an inviting great room featuring a gorgeous fireplace and view windows into the forest, you might not even want to leave the couch! Of course, there’s a sitting deck in the front and a huge wrap-around porch in the back — perfect if you come for the perfect summer weather. Pets are allowed for an additional fee of $50. 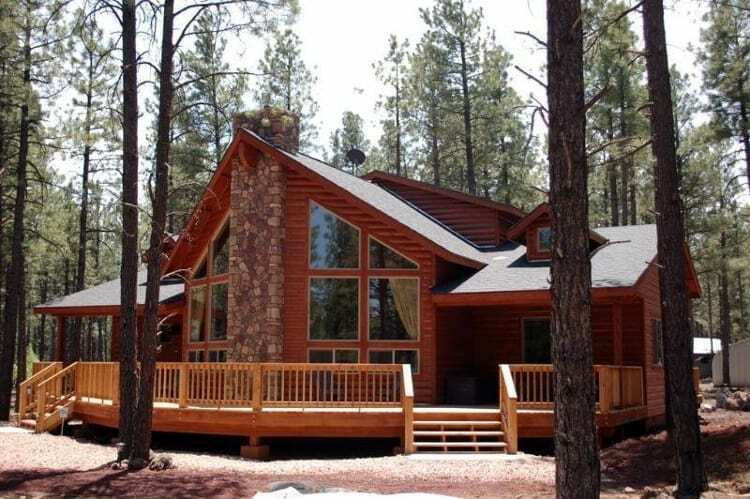 Bearly-A-Cabin provides a “luxury lodging experience in the woods” so you can enjoy the Arizona outdoors without sacrificing the comforts of home. The cabin is 2,260 square feet and comfortably accommodates ten people in four bedrooms and an additional sleeping loft. The floor plan and setup is remarkably similar to Buck N Ham Palace, as they’re owned and operated by the same rental company (located in the same neighborhood too). You can expect the same amazing great room and outside deck spaces — and even a playground in the backyard for the kids.